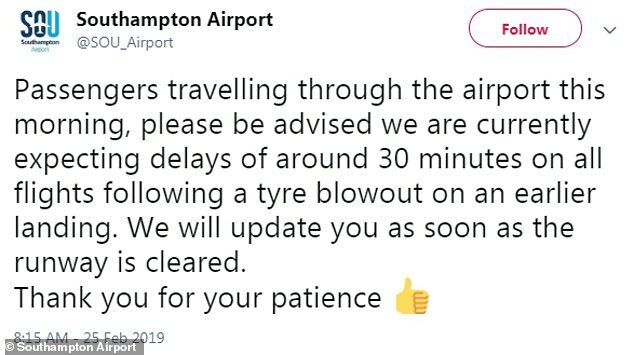 The runway at Southampton Airport was closed for two hours today after a private plane had a tyre blowout on its front wheel while landing. 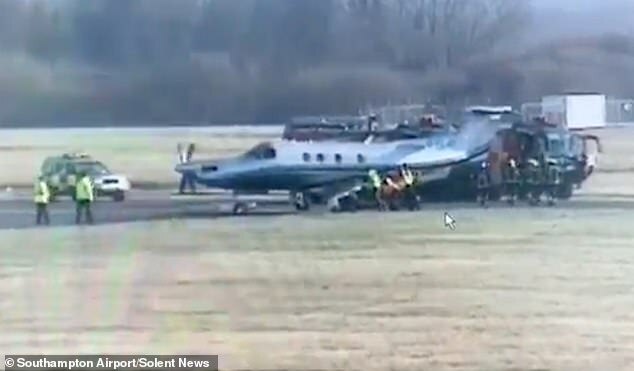 Flights were diverted as fire crews rushed to the scene in Hampshire after the PC-12 jet suffered a problem with its landing gear at about 7.30am. 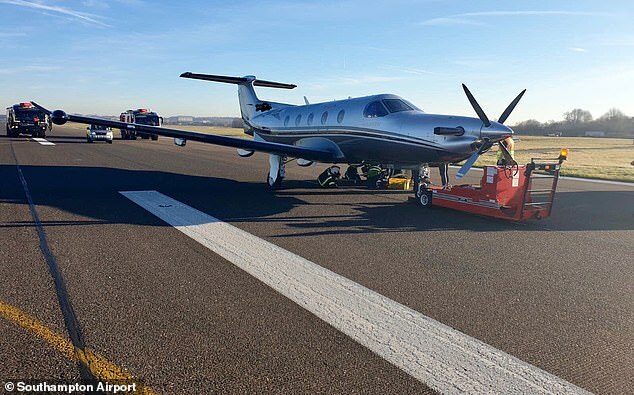 The single-engine turboprop-powered business aircraft, which can carry up to nine passengers, completed its landing safely and no one was hurt. But the airport’s single runway was closed for around two hours, causing delays while crews cleared it and performed safety checks on the plane. Incoming flights from Edinburgh, Amsterdam and Glasgow were diverted to Bournemouth, while services from Dublin and Newcastle were delayed. Budding actor James Fairley was among those caught up in the disruption this morning, as his Flybe flight from Southampton to Manchester was cancelled. Theatre designer Lez Brotherston added: ‘Friends! 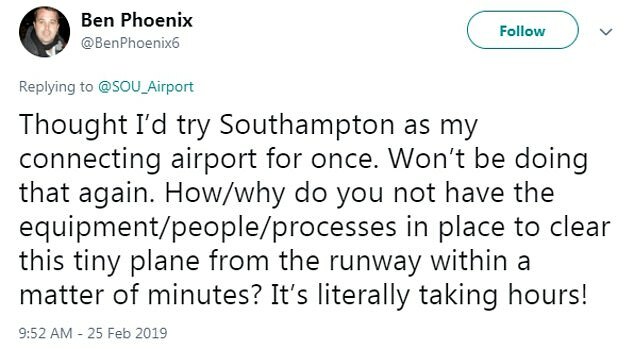 Don’t use Southampton Airport. Two hour delays because of a burst tyre! It brought the airport to a standstill. The airport described it as a ‘very peculiar situation’, adding that the plane’s recovery had proven ‘a little more complicated than expected’ because it could not be towed. 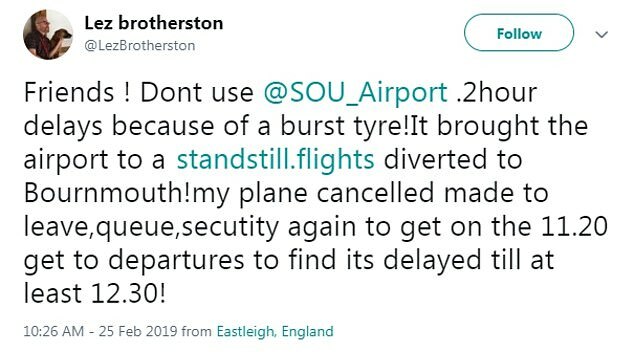 The spokesman told MailOnline: ‘At 7.36am today, a private aircraft coming in to land at Southampton Airport suffered a burst tyre. ‘Recovery procedures were immediately commenced, including teams from airport operations and Southampton Airport Fire Service. 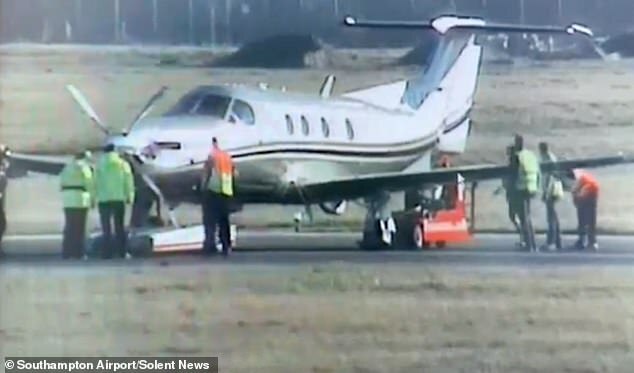 ‘Airport operations were suspended whilst the aircraft was cleared from the runway, which, because of the particular circumstances involved, was more complicated than anticipated.